I am about to go see the Hobbit. It’s been out for over a month, and most people have already seen it. There were so many good movies coming out in December that I didn’t get around to it. Before I head off, I’m going to share this delicious cookie recipe. I found this recipe on another blog, Mountain Mama Cooks. When I saw it, I knew I was going to make it. 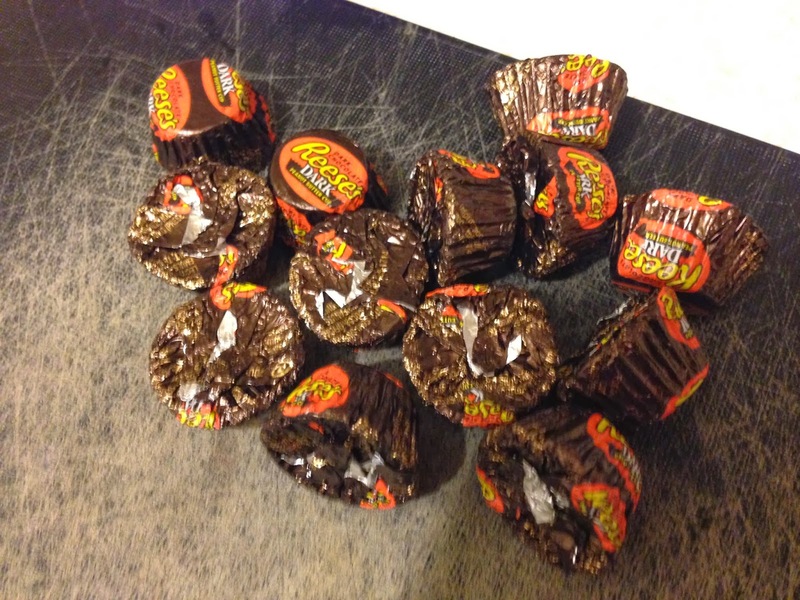 I have no self-control when it comes to chocolate, and peanut butter and chocolate are one of the best pairs around. 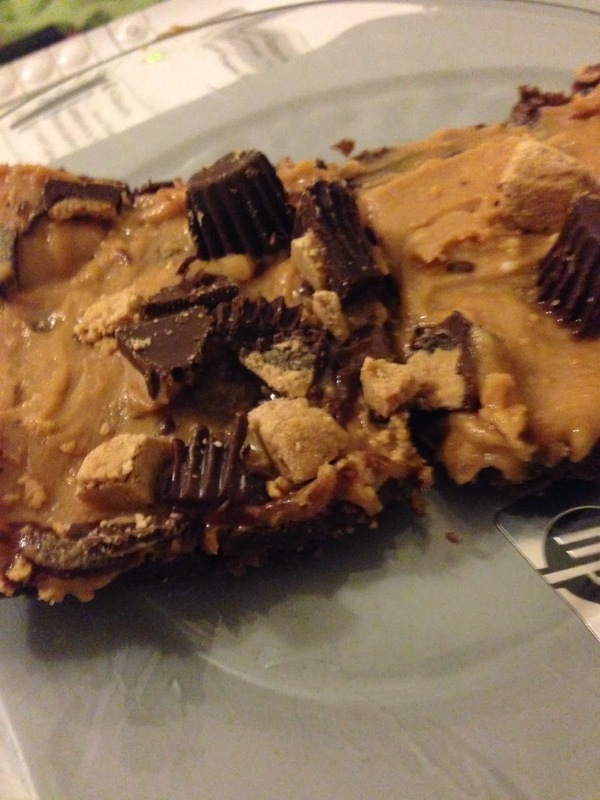 The only change I made was to add more sugar in the form of mini chocolate chips in the bar and peanut butter cups sprinkled on top. I am glad I made them because they hit the spot. Everyone who tried them thought they were brilliant. These are rich and chocolaty. I think you’ll love them. The ingredients for the cookie bar are 1 ½ cup all-purpose flour, 1/3 cup cocoa powder, ½ teaspoon salt, ¼ teaspoon baking powder, ½ cup butter, ¾ cup sugar, 1 egg, 1 teaspoon of vanilla, and 1 cup mini chocolate chips. 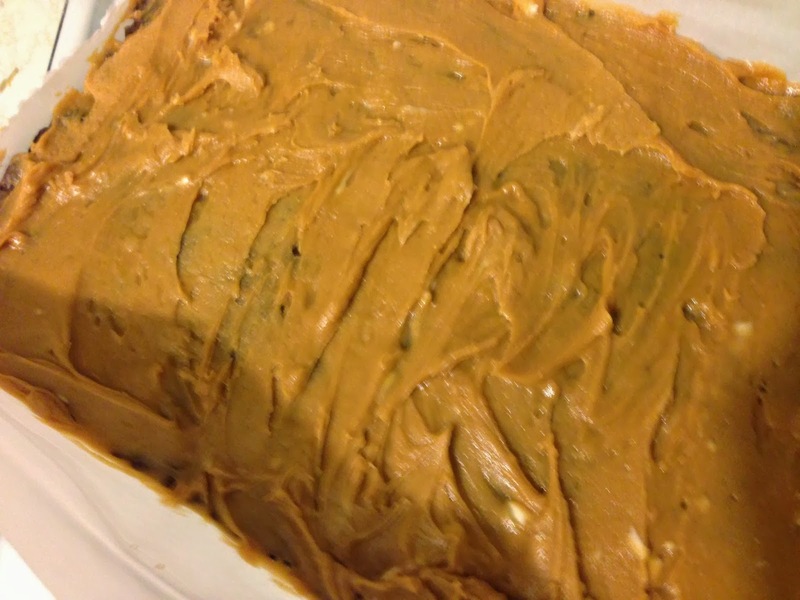 The ingredients for the frosting are ½ cup smooth peanut butter, 4 tablespoon butter, ½ cup powdered sugar, salt, and 1 to 2 tablespoons milk. 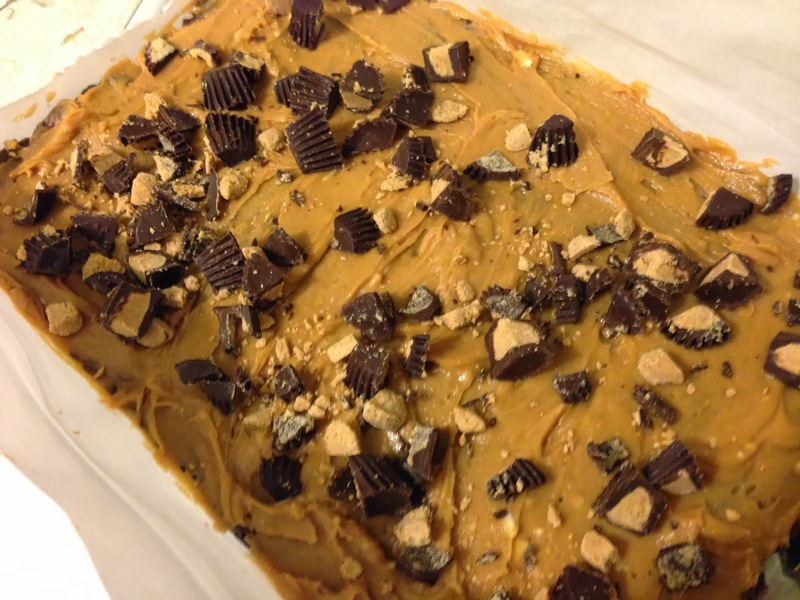 I also sprinkled a handful of chopped up mini peanut butter cups on top. I found these dark chocolate peanut butter cups, and they are super addictive. This are all that remained of a bag I bought for a recent road trip. It wasn’t pretty. For the bars, I started by creaming the butter and sugar. I added the egg and vanilla and mixed well. The original recipe directs you to whisk the dry ingredients together before adding it to the creamed mixture. I didn’t do that because I am lazy, but it worked out fine. I gradually added the flour, cocoa powder, salt, and baking powder into the butter and sugar, stirring after each addition. When it was close to being completely combined, I added the mini chocolate chips. This is thick dough. 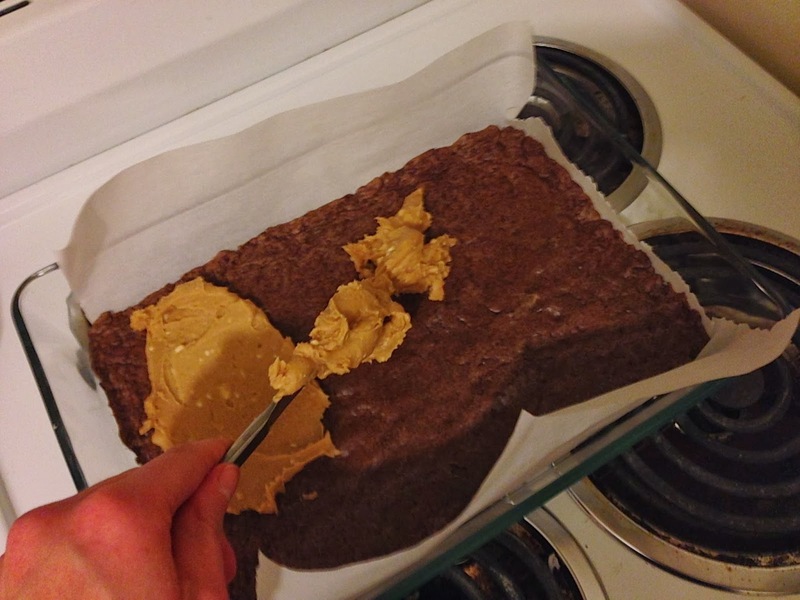 I pressed the dough into a 9 by 13 inch baking pan lined with parchment paper. I tried to create an even layer. I baked the cookie bars for 13 minutes at 350 degrees Fahrenheit. 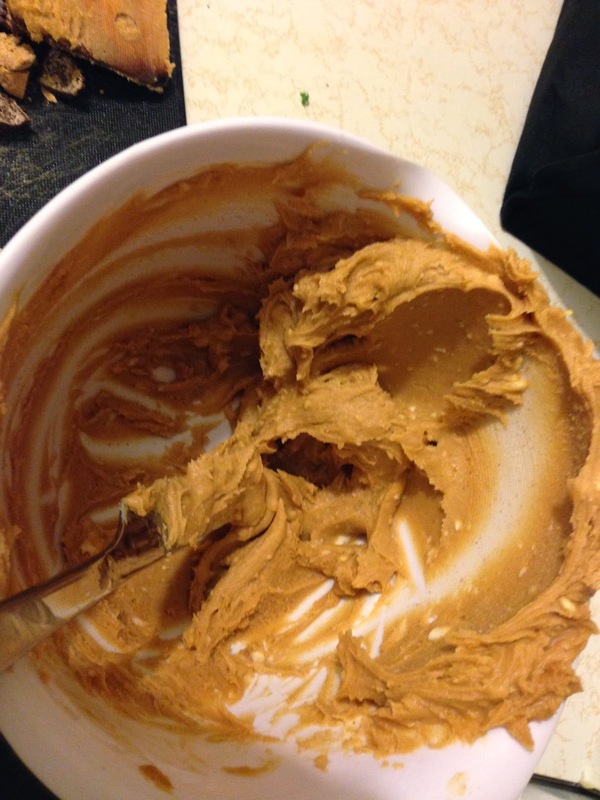 While the bars cooled completely, I made the peanut butter frosting. I just combined the butter, peanut butter, powdered sugar, vanilla, and salt together. After combining all the ingredients, I realized it was pretty dry. I slowly added milk until the frosting had reached the desired consistency. I spread the frosting on top of the cooled bars. 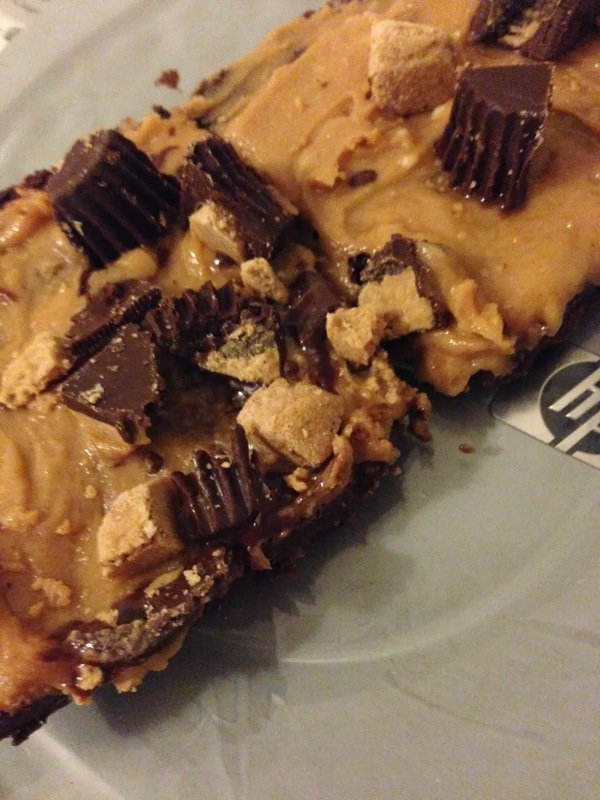 I sprinkled the chopped peanut butter cups on top. Yum! These were delectable! They went quickly. 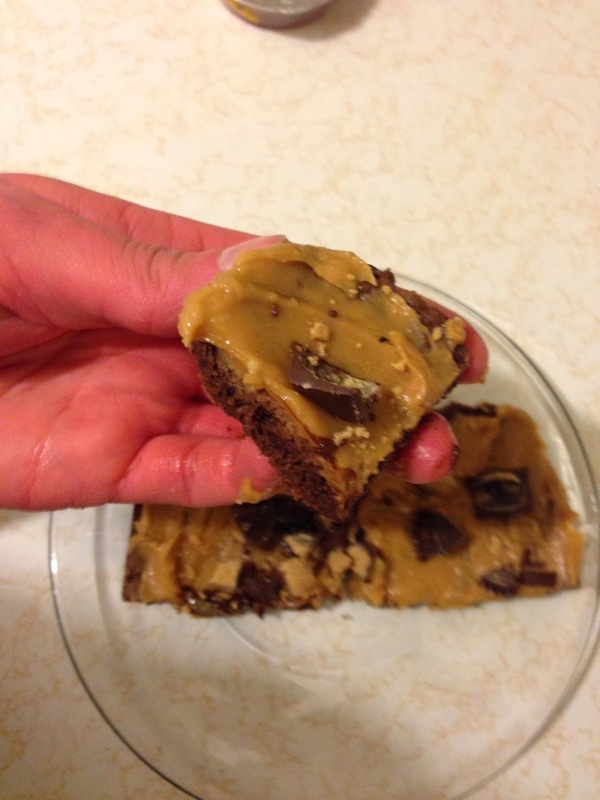 They are not fudgy like a brownie, but the chocolate flavor still packs a punch. I don’t think the mini chocolate chips added much; they got lost in the rich bar. I like this recipe because it makes a manageable amount of cookies. Sometimes cookie recipes have huge yield. This batch made enough to scratch my craving and share without having to stuff my face. 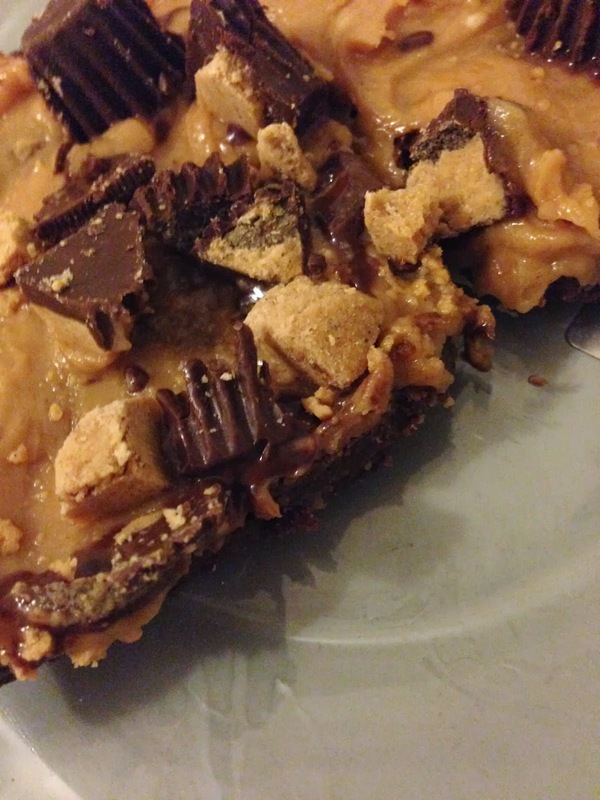 Anyone who CAN control themselves around chocolate and peanut butter is barely human, I'm convinced. THese look amazing! Um YUM! These look absolutely amazing!